While profits in the energy sector cratered in the last quarter, a jump in retail profits of $28 billion in the fourth quarter from the previous year suggests that the S&P 500 will continue to rise. 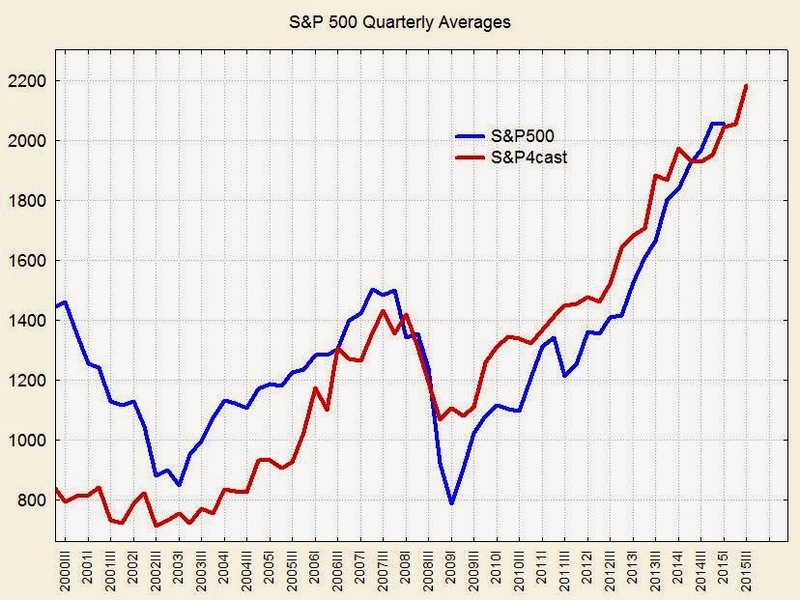 The forecast calls for an average of 2056 for the S&P 500 for Q2 and 2185 for Q3 this year. In order for the quarterly averages to reach such heights, the index would have to set many new record highs. That could happen if more European and Japanese funds cross the oceans to invest in the US as they flee the destruction of their own currencies by their central banks. However, I’m skeptical. Another way to interpret the forecast is as a moving average. In technical analysis, moving averages of varying lengths guide investors timing their purchases and sales. The market crossing the moving average is a buy/sell signal, depending on the investor’s strategy. The graph above shows that the forecast sometimes leads and sometimes follows the market but when the two cross it indicates a turning point. The two lines have shaken hands recently, which could be our turning point for this market.